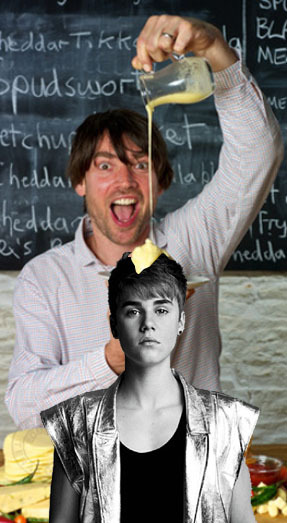 Now that the ANBAD Midweek Mixtape is merely a conduit for another picture of Alex James pouring molten cheese onto something, the pressure is well and truly on. Sometimes it’s a struggle to find a suitable, current, timely cheese victim. 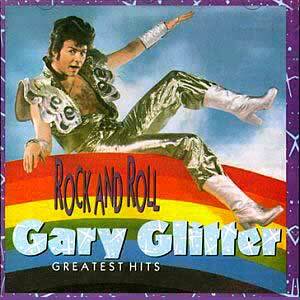 And sometimes, Justin Bieber dresses up like Gary Glitter, and it all seems just a bit too easy. Thanks Justin. And so, on with the first Mixtape of 2012. FIRST! Since being named Britain’s Best New Band by, er, ANBAD this time two years ago, Egyptian Hip Hop have been relatively quiet. And now we know why. It’s because they’ve been making this stupendously droning, otherworldly remix of a Regal Safari track. SECOND! Little Jungles have made a song by more conventional means that touches the same ethereal qualities. It’s a surprisingly glossy, fairly gorgeous swoop through rock’s rainbow. Mmmm. THIRD! Norwegian creep-popsters Philco Fiction have made a song that fools you into thinking that it is covering conventional ground, when it’s actually zooming off into the stratosphere. Smart. FOURTH! File Under Fiction know the benefits of a deep, twanging bass sound. It pops the whole song, the whole band into a specific RAWK place. This is fine, just fine. Posted on January 11, 2012 by Joe Sparrow. This entry was posted in Headline, Today's New Band. Bookmark the permalink.